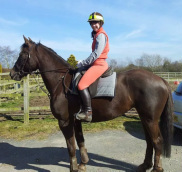 I contacted Anna when I had taken my very worried gelding Alfie as far as I could on my own. Alfie came to me as a very untrusting, suspicious horse and it took me 8 months to slowly gain his trust but he still didn’t like to be touched, became very tense if anybody approached him (even my husband who he saw every day) and didn’t like his hind legs being handled at all. Although he had improved over 8 months he still had a very extreme fear of people. Alfie was also displaying possible signs of pain and discomfort but due to his fear of people it was impossible for a vet to examine him so the vet suggesteed that I ask a behaviourist for help before trying to examine him further. After speaking with my vet and gaining veterinary referral Anna came to visit us and devised a behaviour programme for me to help Alfie to overcome his fear of being touched and build his confidence around strangers. When I contacted Anna for help, I was having difficulties with Bella both on the ground and under saddle and my vet suggested that I should seek further help. Bella had become extremely difficult to catch; even in the stable I was unable to catch her as she would keep swinging away from me and would become very nervous. She would become very nervous about being groomed and having anything done with her, and it seemed that the more I persisted the worse she became. Under saddle Bella developed a habit of running out of control in the arena. Her back end would go right underneath her, her head right up in the air and she would suddenly run as though in a blind panic, and when she came to a stop she seemed very scared. When Anna came out to see us she was able to highlight lots of things about the way Bella was behaving that I hadn’t realised, and she gave me lots of practical advice to help me to deal with the problems we were having. After the initial consultation we had a follow-up training visit from Anna, and within this one session Bella was more responsive to being caught in the field than she had ever been in the 18 months that I had owned her! Anna begun to teach me how to listen to Bella and observe her behaviour carefully so I could try and understand how she was feeling. Having followed Anna’s advice Bella is now like a different horse! Living out 24/7 really does suit her and she is now standing over my shoulder insisting I put her head collar on! She is good for grooming now and stands happily munching her hay, whereas previously she would stop eating whenever I did anything to her. Previously she would tense up if I walked away and re-approached her, but now she stays relaxed and carries on eating. Bella needed to be checked by the vet to rule out pain as a cause for her problems, but she had become so nervous that even this was impossible. Because of the progress we have made, the vet has now been able to examine Bella and gave her the all clear so that we can continue with the rest of the behavioural programme. Because of the information that Anna gave to me, I now feel I can understand Bella’s behaviour more clearly, and when she is trying to tell me something I can pick up on it much more quickly. This has improved our relationship greatly, and I think we now have a much brighter future ahead of us as a partnership. Thank you so much for coming to see Ebs to help with her loading problems. It was really nice to have such involvement with the process as I wasn't expecting to do much handling (surprisingly). It was really great how informative you were and how you had the time to explain things. Everything you did was brilliant and really clear. We really appreciate your time to help, and your advice has even come into good use when I am riding. Whilst following our shaping programme we have had great improvement. Yesterday, 15 minutes into our session she decided that her back feet could step onto the ramp! Break through! I was so pleased! Then things got better. I stood inside the box just next to the tack locker and every time she edged closer I would go and give her a tickle. She then spotted the molasses lick that was on top of the locker and after a few minutes she just marched straight in. I honestly could have cried! She had a mouthful of lick and was just sniffing round. She didn't rush out, she was quite happy stood at top of the ramp. So I thought great, she's had the confidence to go on so tomorrow is another day. I thought "well even if she spends 5 minutes on the ramp we will call it quits for the day". But to my surprise she put her front feet on then tentatively walked up and straight in, literally in about 3 minutes! Again very comfortable on the box doing exactly the same sniffing and licking at the molasses. So I took her off and turned her back round, again thinking well if she just stands on the ramp for a couple of mins she can go out. But no she went straight up and in again. I was so happy! Couldn't believe it. It was her decision she kept walking so I just followed her. Im so chuffed with her. I really think something has just clicked. Though saying that I'm sure we may have set backs but I won't become disappointed as I know she's been on and it was her choice. Can't thank you enough your tips and training points are all fitting together!